Norland Scothern Log Cabin Gazebo: The Norland Scothern Log Cabin Gazebo is a large, two roomed Log Cabin Gazebo. The Scothern features an open fronted area which is simply ideal as a garden dining area in cooler weather or if you are expecting guests for a barbecue then dining in the Scothern is simply ideal. 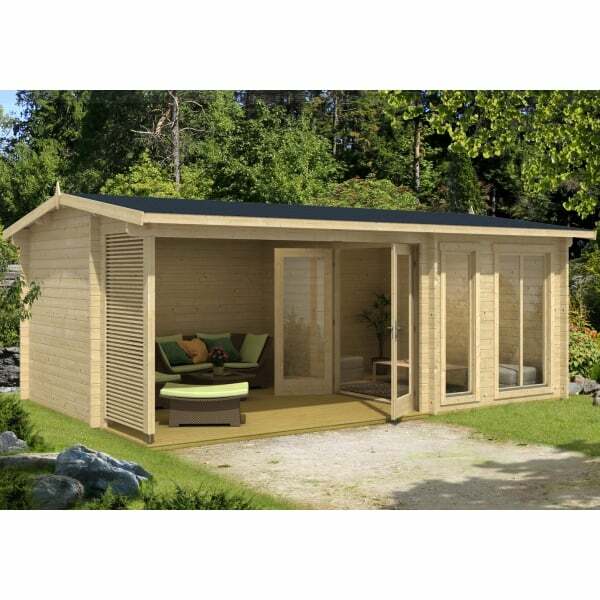 Another use for this type of log cabins is that they are ideal as a Hot Tub enclosure. Sheltered from three sides to avoid exposure to two much wind yet still open o the forth side for the pleasure of open air bathing. The enclosed room is an ideal changing area Manufactured using 44mm wall logs and with all glazing being Double Glazed. The chalet cut corner jointing that is used in our Norland Range of log cabins means that the corner joints are cut to very fine tolerances and are therefore very weather resistant. The Repton can be built either as shown in the main image or in “mirror” to that so that the enclosed room would then be on the left side as viewed.